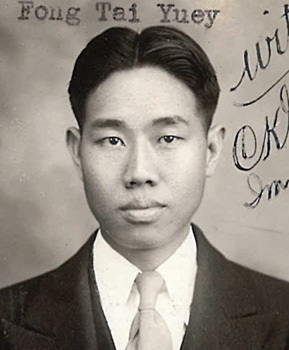 In May 1913, Chun Kim Shee’s father, Chung Seung, applied for admission to the United States at San Francisco, as the son of Chun Poy, a U.S. citizen born in Los Angeles, California. Two years later he returned to China, married, and a son, Chun Kim Shee, was born on 23 April 1917 in Chew Gong, Sun Ning. 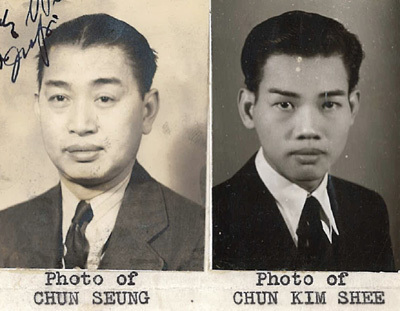 Chun Seung swore in a November 1939 affidavit that he was a Section 1993 U.S. Revised Statutes citizen** and by virtue of the provision his son was also a citizen of the United States. The affidavit contained photos of Chun Seung and his son. Chun Seung, Chung Kim Shee’s father, testified that his married name was Gwok Shew; and he was born at Gong Village, Toy San District, China. He lost his Certificate of Identity in San Antonio in 1932. It was locked in the safe at Wah Lee Restaurant when the company went broke and shut down. He never got his certificate back. His father and mother, Chun Poy and Pang Shee, were both 69 years old in 1940 and living in their home village in China. 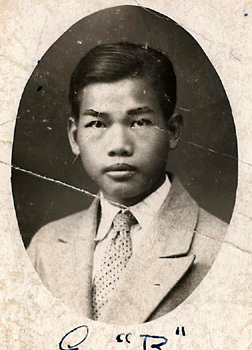 Chung Seung presented two photographs to Immigration: one of his son at about age 4 or 5 with his mother, Lee Shee; and a photo of the applicant when he was about 16 years old. Witnesses for Chun Kim Shee in December 1940 were Jew Ning Fook of Bakersfield,California and Fong Tai Yuey/Yui of San Antonio, Texas . 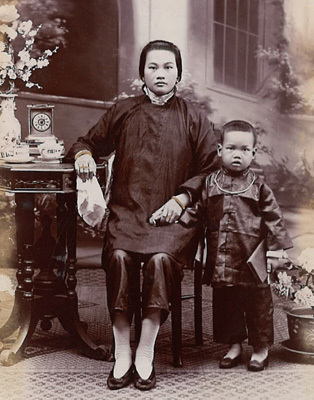 “Photo of Chun Kim Shee and his mother,” ca. 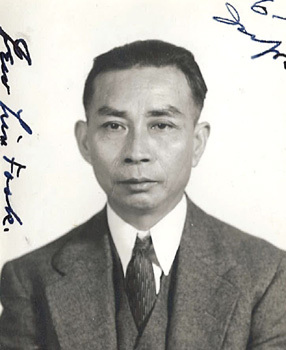 1921; “Affidavit Photos and Witnesses photos,” 1939-40; “M143 photo of Chun Kim Shee,” 1940; Chinese Exclusion Act case files, RG 85, National Archives-Seattle, Chun Kim Shee case file, Seattle Box 815, file 7030/13212. 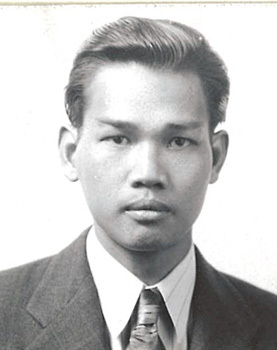 Fong Tai Yuey (marriage name Fong Hong Dot) was born in Leung Boy, China in 1909 and he first entered the U.S. in 1929. He was known as Frank at the Alamo Grocery and Market in San Antonio and owned one-fourth of the store. In his interview he correctly identified the photos of Fong Ging Pawn, Fong Tai Dee, Dong Tai Jung, Chun Seung, Chun Lim, Chun Fat, and Chun Poy from their San Francisco files. Fong Tai Yuey had a Seattle file and a San Francisco file. Jew Ning/Lin Fook who had a San Pedro file gave testimony and the record was forwarded to the Immigration Office in San Antonio, Texas. In late November 1940 Chun Kim Shee, the applicant, was sent to Seattle Marine Hospital for examination and treatment. He was suffering from severe pain in his stomach. There is no mention of his diagnosis, but he was finally admitted on 18 December 1940. The amended section 1993 (48 Stat. 797), went into effect on May 24, 1934, at noon eastern standard time. It stated that: Any child hereafter born out of the limits and jurisdiction of the United States, whose father or mother or both at the time of the birth of such child is a citizen of the United States, is declared to be a citizen of the United States; but the rights of citizenship shall not descend to any such child unless the citizen father or citizen mother, as the case may be, has resided in the United States previous to the birth of such child. In cases where one of the parents is an alien, the right of citizenship shall not descend unless the child comes to the United States and resides therein for at least five years continuously immediately previous to his eighteenth birthday, and unless, within six months after the child’s twenty-first birthday, he or she shall take an oath of allegiance to the United States of America as prescribed by the Bureau of Naturalization.